It’s always boggled my mind that despite all of the insanely talented graphic designers in the world, Kleenex has yet to hire someone to help them kick it up a notch in the aesthetics department. Sure, many home stores sell tissue box covers, but the ones in my price range didn’t quite do it for me either. Hello, champagne taste on a beer budget! Anyway, I get it. It’s a tissue box; it serves a very practical purpose and isn’t meant to be centerpiece-worthy. And, yes, I’m sure I’m one of the few people on the planet who is this passionate about tissue boxes. However, at the end of the day, tissue boxes are on display, making them home decor in my book. 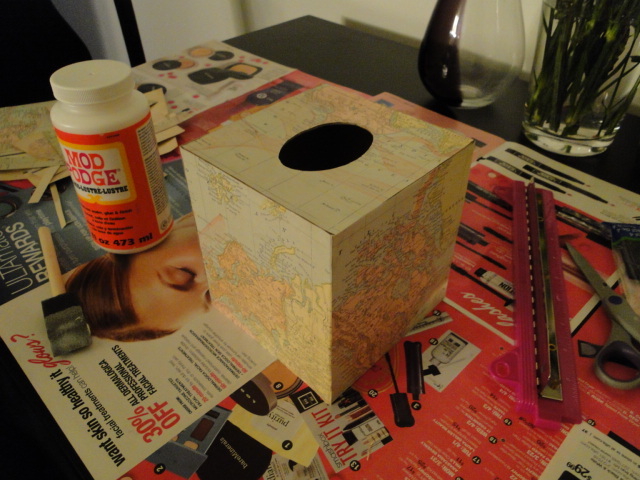 This DIY project was ultimately inspired by both my irrational distaste for standard tissue box patterns and the glorious online marketplace also known as Etsy. Because of Etsy, I’ve developed an infatuation with antique/vintage items in general, but more specifically, antique maps. 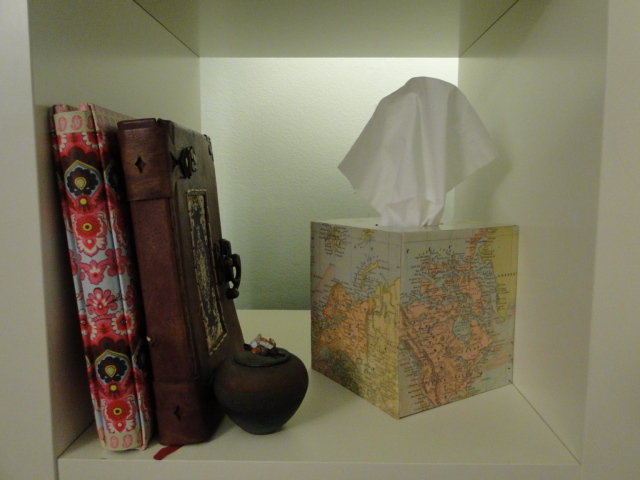 I eventually decided that the only tissue box cover that I would be satisfied with was one decoupaged with one of my new treasures, an 1883 world map. 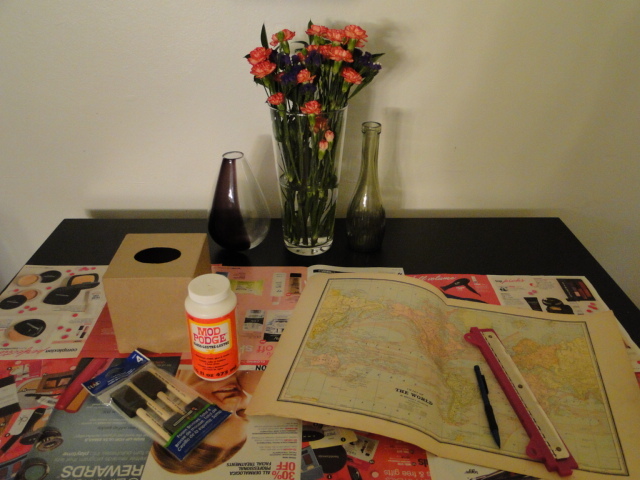 Mod Podge, a decoupaging essential, comes in several varieties, but for the purpose of this project, you’ll want to opt for either matte or gloss. Personally, I went for gloss. My taste is very eclectic in nearly all aspects of life, and my taste in home decor is no exception. I have a variety of things that are rustic and glam and everything in between, so I thought the high gloss finish would be a nice contrast to the old-world feel of the antique map. 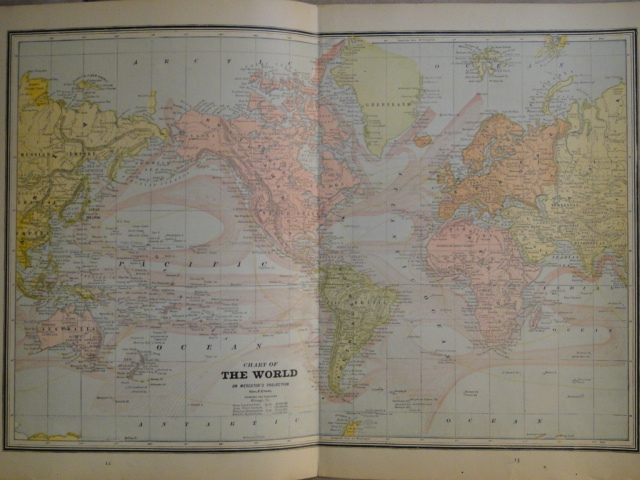 In terms of the type of paper you use to decoupage, the options are endless and are certainly not limited to antique maps. Vintage illustrations, pretty scrapbook paper, and high fashion magazine ads are just a few ideas that come to mind. I purchased the map used for this project (along with a couple others) from mysunshinevintage, an Etsy shop that has thousands of antique maps and vintage illustrations for sale at extremely reasonable prices. 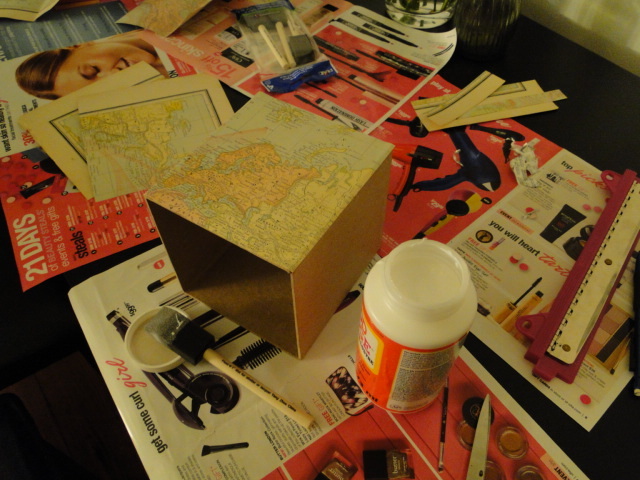 As it turns out, decoupaging is easy-peasy. It is both relaxing and mindless in the best way possible. In fact, I did this project over a couple hours while blasting some of my favorite albums and engaging in some “me time.” Best of all, I love the personalized feel it adds to my living space. P.s. 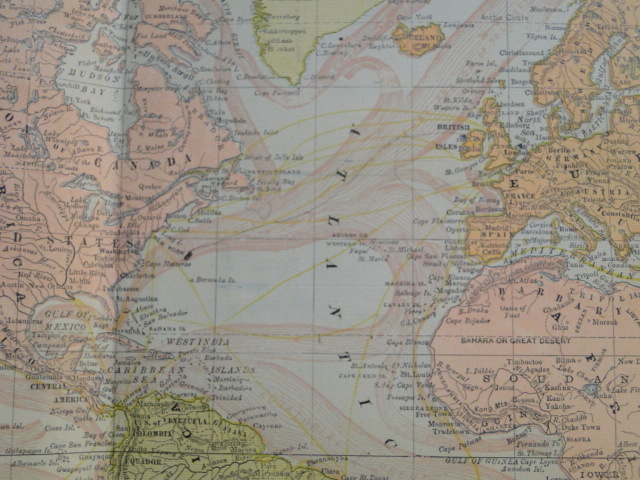 If you look at photo #3 closely, you can see a mapped out route, in pencil, from London to New York City! How incredible would it be if this were done by the map’s original owner? One can only assume, but regardless, it made me appreciate the history behind this map that much more. I’m so happy I caught it while I was cutting away. Well this post put a big smile on my face when I read it. I always think about the lame selection and lack of creativity in tissue boxes every time I go to the store to buy them. In my mind I wish there were more and settle on the best that I can find. In the back of my mind I think someday I will design them myself. And then I see your post! I love the idea of the vintage map… Clever! I think I’ll try it with beautiful wrapping paper. Do you think Fabric could be used? Well, I do learn from the best, ya know! And you can definitely use fabric. 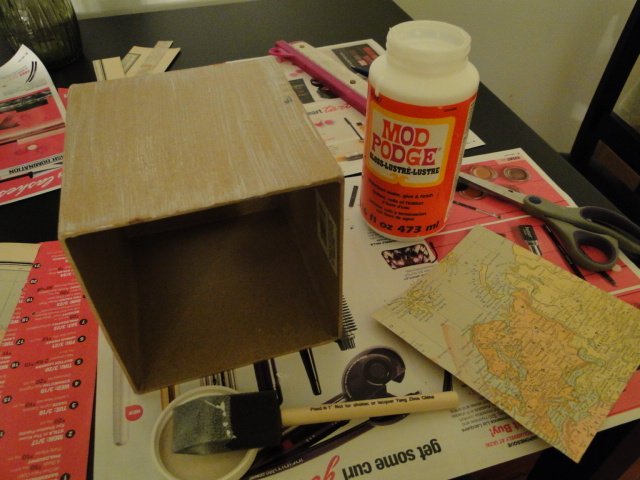 There’s Mod Podge specifically for it!